For most of us, getting older brings with it more than a few harsh realities. Think unsightly lumps and bumps… getting thinner on top… and just being plain worn out. It’s pretty much the same for cricket pitches! Each pitch (or ‘lane’) was about half-and-half synthetic surface and grass; in other words, 10 metres of synthetic covering (starting at the batting end) and 10 metres of grass (starting at the bowling end). The synthetic sections were looking very worn and sad! The netting alongside and above each lane (to stop cricket bowls being hit everywhere) was looking pretty shabby too. Now the wickets are back – better than ever! The synthetic sections of three of the pitches have been resurfaced with the latest and best covering. The netting for each of those wickets has been replaced. Best of all, the fourth wicket has been extended and upgraded to full match length, i.e. all 20 metres of the pitch is now sealed with a synthetic cover, and is fully enclosed by new netting. The bill for the work came to $58,000; the Office for Recreation, Sport and Racing covered $20,000 of that with a Round 43 Active Club Program grant. 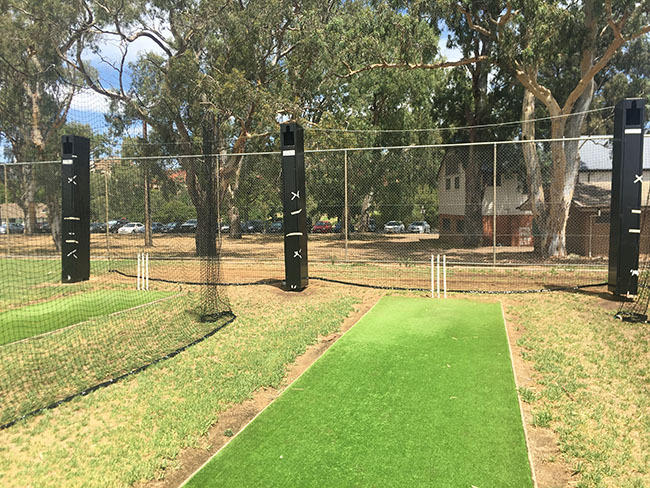 The general community is also reaping the benefits; the wickets are popular with other organisations like SA’s Blind Cricket Association, and with everyday cricket lovers just wanting to have a hit (or relive past glories… or imagine future ones! ).